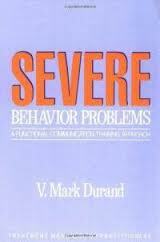 Severe Behavior Problems: A functional Communication Training Approach (Treatment Manuals for Practitioners) by V. Mark Durand. Dr. Durand presents an easily understood, yet technically tight, presentation of functional communication training. Dr. Durand provides an excellent demonstration of the applied analysis of behavior and provides a framework for understanding that behavior. He discusses using requesting skills to replace instances of severe behavior. Pp. 183. This entry was posted in Behavior Modification, Our Library and tagged aba, Autism Spectrum Disorder, behavior modification, books, functional analysis. Bookmark the permalink.